Yogurt is my everyday snack in whatever form, buttermilk is the favourite drink that I keep making with several herbs or just with a hint of salt when in a hurry. I like it chilled, at room temperature or cooked in curries too. Yogurt in an Indian home never goes waste even if it becomes too sour. We have a recipe for all kind of yogurt and we like making our own yogurt at home. For a couple of years in between, I had started buying yogurt from the neighborhood booth of Mother Dairy. Despite the fact that I know packaged yogurt is not the same as home cultured ones, I fell prey to the convenience factor. And then I realised I was not eating yogurt everyday anymore. Yogurt was just a bowl of a good thing I had to tell myself to eat, there was no pleasure in doing so. And then while shifting some kitchen utensils to another cupboard I found this pretty earthen pot that I used to set my yogurt in. I held it in my hands for a while, sniffed the insides and it still smelt of yogurt. The porous material holds the yogurt within. I washed it, filled it with warm milk and kept it covered on the kitchen platform to find perfectly set yogurt in about 4 hours. Indian summers are great for yogurt making. Exactly the way it used to set earlier, the familiar aroma, the familiar layer of watery whey and some floating mass of live culture. Lactic acid bacteria can remain dormant for long time and revive as soon as they find milk. And they did well in this case too. And then it became a daily routine and I started looking forward to my yogurt once again, sometimes having another bowl just because I loved the taste so much. I even started reducing the milk to thicken it and setting yogurt in the earthen pot just like my grandmother used to do. The yogurt made with reduced milk tastes more rich and a bit smoky. But that phase got over because reducing milk is no fun. I resorted back to just heating milk to about 45 C and setting yogurt every single day. 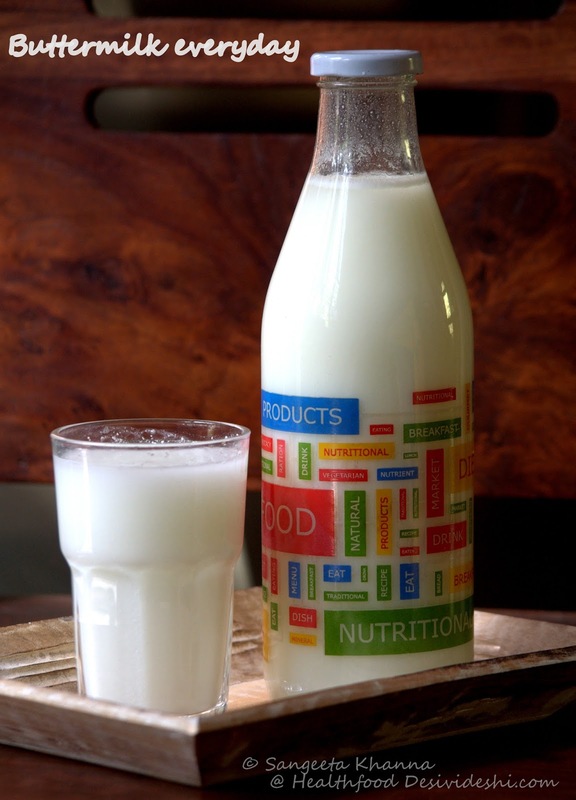 Use unpasteurized milk if possible, but pasteurized milk also makes good yogurt, the 'yogurt culture' has to be good quality and that is the deciding factor in how your yogurt turns out to be. Get your yogurt starter from a home where yogurt is made regularly. Beg, borrow, steal, trust me a good yogurt is worth all the effort. If you live in a part of the world where no one makes their yogurt at home, you could look for cultured yogurt or cultured buttermilk on the supermarket shelves or at health food stores. Use 1/4 cup of cultured buttermilk as a yogurt starter for the first batch of yogurt and then use a tbsp from the fresh yogurt you made. To make yogurt just heat the milk to 40-45 C or lukewarm to touch, mix 1 tbsp of good yogurt (or 1/4 cup cultured buttermilk) to it, whisk well and cover. Keep it in a warm place till the yogurt sets. It takes about 4 hours in Indian summers, in winters we keep it either in water bath or inside warm oven. Don't forget to save a tbsp of starter from each batch to set the next batch of yogurt. If for any reason you cannot find any yogurt starter or cultured buttermilk, use dry whole red chillies with their stems to set yogurt. They have lactic acid bacteria on the surface and they help set perfect yogurt. Just warm milk, pour in the pot to set yogurt and drop in a couple of dry red chillies on it. The chillies don't submerge. Remove them as soon as the yogurt is set. The chilies don't impart their heat to the yogurt. I hope I keep being regular with my yogurt making now, as there is no match to the taste of real buttermilk that I make after churning the butter for making ghee. Yes I started making ghee too again. That we will discuss some other time. The homemade yogurt brought back the habit of tossing fruits in yogurt too to make a filling snack or a cooling light lunch. You want to eat more yogurt in many different ways when you have good delicious yogurt at hand. The fruit yogurts are perfect snack for office too, you can always carry an extra jar of fruit yogurt or an appropriate glass container that doesn't leak. We like any fresh fruit in yogurt. It is always much better than the 'flavoured' fruit yogurts. Here is a musk melon, sticky dates, chopped almonds and chia seeds yogurt. It doesn't need any sweetener. The real taste of a fruit cannot be achieved by chemical flavorings, though chemical flavorings and sweeteners together may make the fruit yogurt comforting in nature IF you haven't ever tasted the real thing. Try making the real fruit yogurt and compare the two. You will find all your answers. 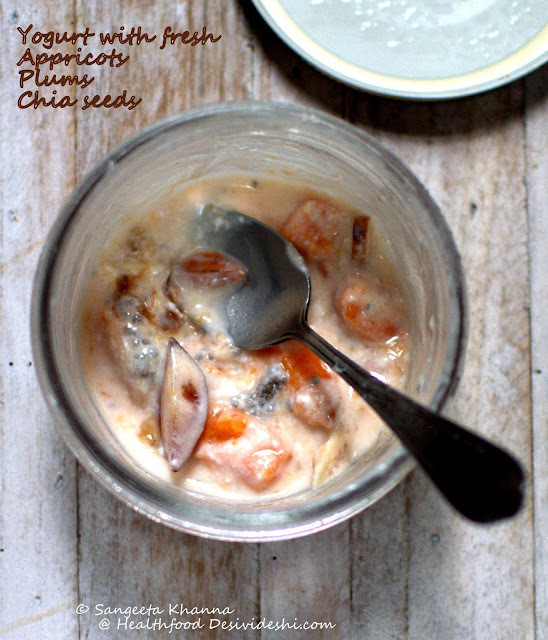 Here is another version that I make using apricots, plums, some chopped figs (dried), chopped almonds and chia seeds. After about 4-5 hours the flavours mingle so well it looks like this. Absolutely yummy. You can play with seasonal fruits or use dried fruits if you could shop for grocery lately and there is no fresh fruit left. Yogurt will make the dried fruits better. Add chopped nuts and seeds as you like. These fruit yogurts can be a meal in itself if you wish, have it in a huge bowl and stop worrying about calories in it. Fresh fruit yogurt can't have more calories than you can handle. Or have a fruit yogurt as a generous dessert after a meal. 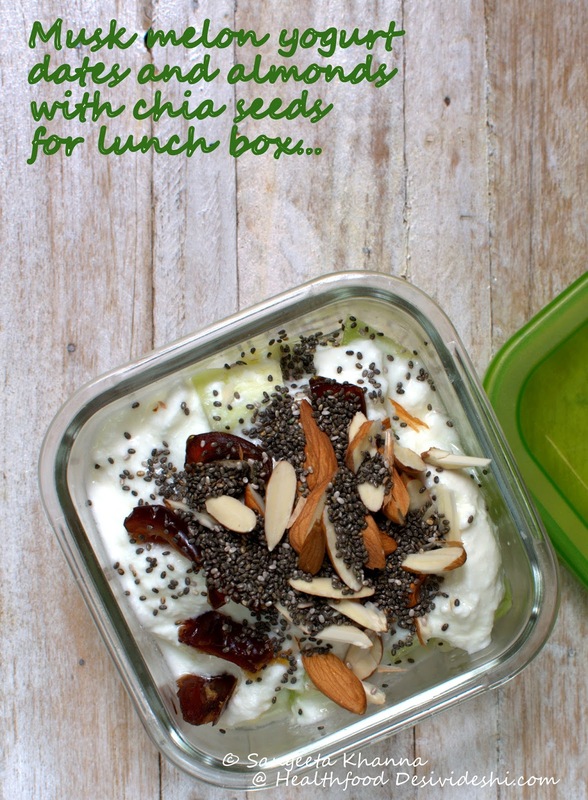 For lunch boxes too yogurt can make a plain packed meal interesting and nourishing at the same time. 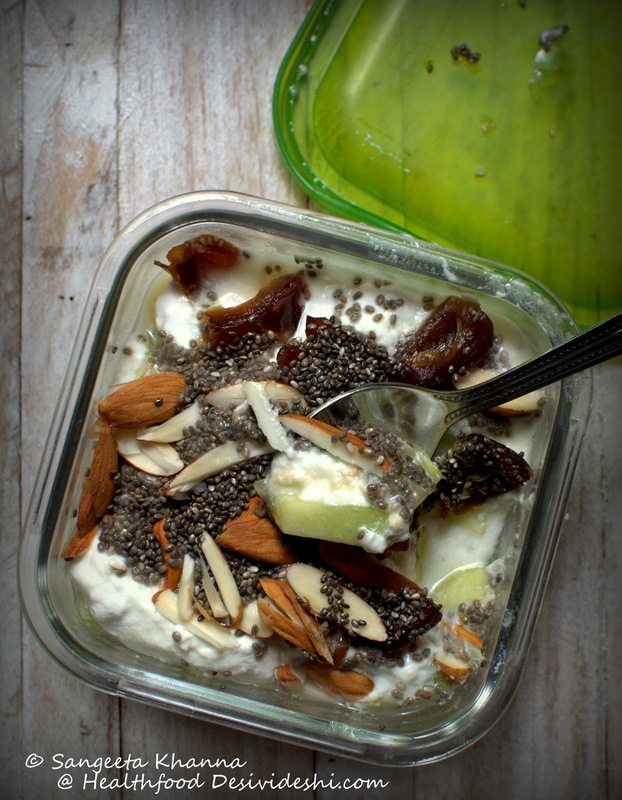 Those who don' like yogurt or avoid milk products can always make a nuts and seeds salad with some sauerkraut or pickled salad thrown in for the daily dose of probiotics. Get a leak proof tumbler or a nice bottle for flavoured or herbed buttermilk. Buttermilk is a great way to hydrate during summers and can be a good substitute for coffee and milky chai if you have fallen pray to work time coffee habit. Try some intense mint or curry patta spiced up buttermilk and see how it brings back the energy level. Electrolytes, much needed water and probiotic all at the same time brought to you by buttermilk. 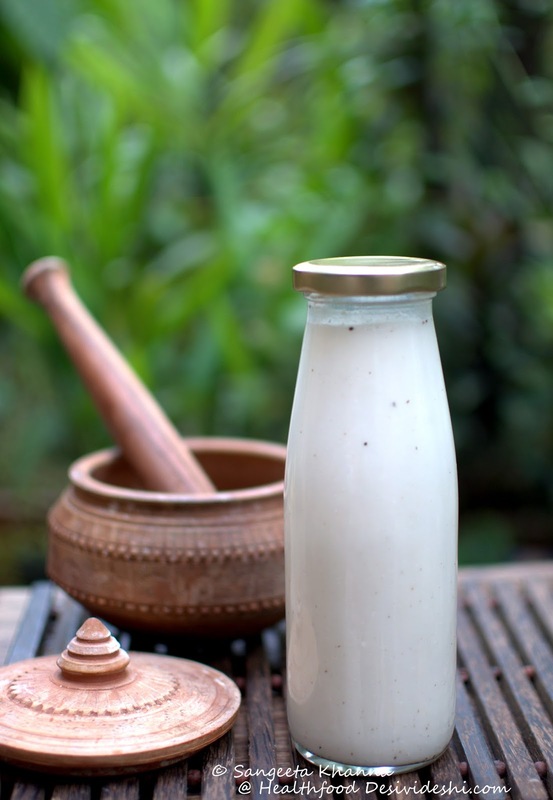 Dilute the buttermilk if you plan to have it frequently and use fresh herbs or dry mint, curry patta or moringa powders. 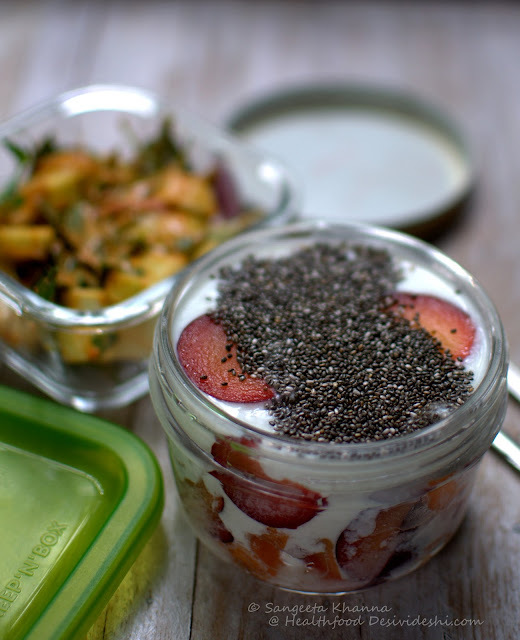 A suitably sized glass jar or Tupperware container is also good for yogurt. You can have a few of these and set your yogurt directly in these jars and refrigerate. Fruits, nuts and seeds etc can be added and the jars can be carries as is. You can try freezing the buttermilk or fruit yogurt containers and packing them in padded bag to carry if your office doesn't have a refrigerator to store. This way the yogurt or buttermilk comes to right temperature at the time of consumption. There are some ice packs in the market that can be packed along with yogurt in a bag so keep it chilled. In air conditioned offices the yogurt and buttermilk doesn't spoil normally, the above suggestions are good if you like your yogurt chilled. Keep some herbs ready to flavour the yogurt and buttermilk everyday, fresh fruits or dehydrated fruits are a personal choice but make arrangements of the ingredients before had so you keep up the habit of carrying your own yogurt. A very dear friend who is single and male and cooks his own lunch boxes, told me recently that he started carrying buttermilk with his lunch box after seeing my buttermilk pictures. But his office friends started asking him why does he carry so many things to eat like kids, not that my friend cares. Let me tell you one thing, the same friends will come to have a sip after a few days and then some of them will start bringing their own too. Make it fashionable in your office I say. There is nothing more refreshing than a fresh mint buttermilk. Loads of mint, hint of green chilly or black pepper and salt makes me refreshed always without a fail. And it is not just about the momentary refreshing feeling. It is also about how your gut feels after a few shot of 'work stress induced coffee' and how this coffee induced freshness lasts only an hour and after so many shots of coffee you still feel dull in the evening. Start having these variations of buttermilk or Iced teas and see how the 'real' herbs and electrolytes boost your spirits and keep your gut also healthy. You will feel the difference every evening trust me. Note that you can win a few useful pretty things useful for your lunch boxes in the ongoing lunch box series. A couple of these pretty bottles for buttermilk and Iced teas are also being given away to one of the comments that I like. Please comment below and tell me if you carry yogurt to office and what way you like it. There is a Tupperware steamer and a hand painted lunch box by Trove as give away too, check out the lunch box series for more useful information and participate by commenting on any of the posts you like.. It is as if we are on the same wavelength when it comes to good food. I like to eat healthy as well but not compromise on the taste. Eating a small cup of yogurt made with whole milk is more satisfying that eating a tub of fat free version. Love your ideas of adding fruit. I eat mine with a tsp of jam and granola added for some crunch. Thank you. Even I used to add jam to my yogurt earlier :-) Granola too whenever I have some, we don't eat granola regularly so the additives are flexible. Love this post, Sangeetha!! I too have fallen prey to the convenience factor of packaged yogurt and keep planning to set my own yogurt. Will do it today! Thanks Priya. I love Kolkata style mishti doi too and make it sometimes. Will try and post a recipe soon although you must know that some mithti doi vendors in Calcautta use cornstarch and added fat (often trans fat) etc to thicken the yogurt. Homemade is better always. Thank you so much Prasad. Now I better write about home made mithi doi too as there are 2 requests in this post :-) Will do that soon I promise. 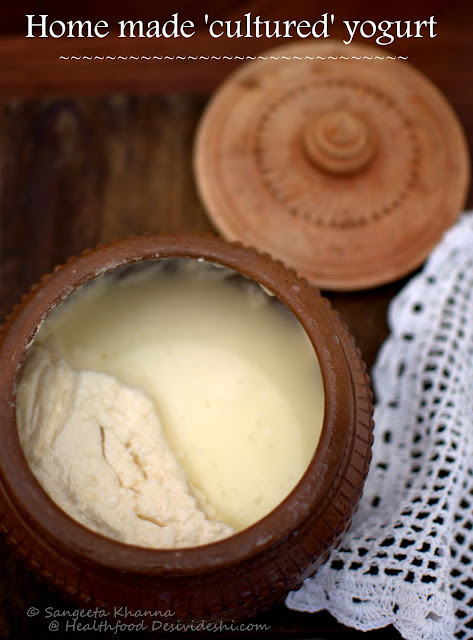 I don't use earthenware pot but yes, I used to set curd regularly. Not recently though. Must revert to the original method. That red chilly method is so interesting. I must give it a try. Thank you Rachna. Do let me know when you try the red chilly. Just love your earthen pot... I too make curd at home but in stainless steel pots nothing fancy like yours. Do we need to do some processing before we can use a new pot to set curd? When my daughter was small she used to like those flavored yogurts, used to call them ice-cream. Now I have stopped those and the home curd is so yummy that she usually eats it as it is no sugar even. Thats the difference in store bought n homemade one. 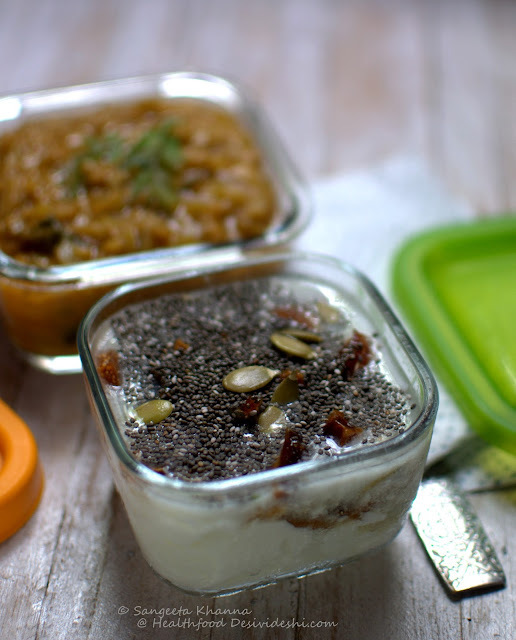 Never thought of adding fruit to curd, always had it as raita with boondi or cucumber/tomato .. will surely try this fruit flavored ones soon.... and whats great about it is that your can make it ahead and store... lovely! Thank you so much Samidha :-) You don't need anything fancy to make yogurt but using glass containers or ceramic etc is better I feel. Although I have set yogurt in steel too sometimes and could not see any difference. Earthen pots are special and I was tempted to try using them few years ago. But remember that earthen pots don't work well for setting yogurt during rainy season. Hi Sangeeta! you have certainly given me one more reason to visit your very interesting and informative blog! I did not like having dahi as part of my diet till a couple of years back, but now I am addicted to it! I have it in the form of plain dahi, with a sprinkle of roasted jeera powder or make buttermilk out of it. I have severe acidity problems and ever since I started to finish off my meals with dahi/buttermilk, I found that the acidity was going away! 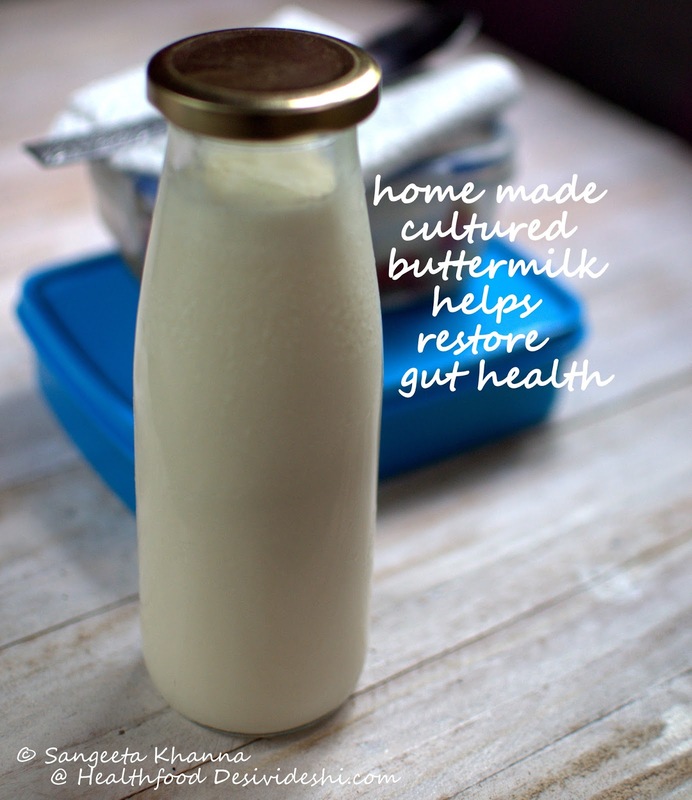 As rightly mentioned in the blog, it does help in balancing and restoring gut health. Being a Bengali, I do love my misthi doi as well to round off a perfect hearty Sunday lunch! I absolutely love the idea of adding fresh fruits in the yogurt! These will be my try outs for my lunch box. Thanks and cheers! Thank you for this rich and insightful article. Having given up dairy when we went vegan, I've been experimenting with non-dairy curd, and my gut seems grateful for the probiotic boost. Non dairy curd tastes surprisingly like the dairy version - however cultures are hard to find these days with most people choosing to buy store bought curd which is not fermented properly - so your chilli crown tip helps. Thanks a ton! Sangeeta, Love this post for so many reasons....first & most imp. one is it brings back so many wonderful memories....after my marriage when I moved to States & I made dahi first time at home my husband was like a kid in a candy store, let me tell U...he's pretty gud in kitchen & quite famous among his friends for cooking food....but dahi was one thing he was always upset as he never tried making one & whatever he could find in that small small city was fruit yogurts only(no sweet dahi for him), no Indian stores near by for hours & hours......so he always had buttermilk(easily available in american grocerries also) in the fridge & I used that as starter to make home made dahi....I was happy but in the coming months I realized homemade dahi was like a gold among Indians :) settled abroad....At dinner parties it became a norm to distribute starter to friends coming from far & near. Fruit yogurts are more of a husband's choice, I like my yogurt plain and the buttermilk is more of my favourite. But I love my hung yogurt based desserts a lot, just with a hint of sweetness. 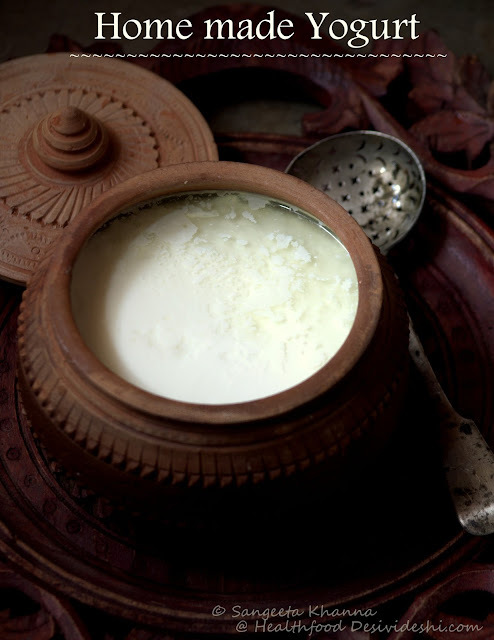 Nothing matches in taste to the homemade dahi - more so when the milk is unpasteurised fresh milk. Sweetened with a spoon ful of homemade chunky jam is how my son takes it in his lunchbox. I get some of these at Gaffar market in central Delhi. Oh ! That was priceless ! .. Loved it. Yoghurt is a must in my home specially where my son is concerned. Currently in hostel doing his Computer Engineering this is one thing he misses the most there. However, I use very little Jaman to set mine at home; a teaspoon at the most. I then add lukewarm sieved milk (In winters I keep it slightly warmer with a little more Jaman) and having added the milk, I transfer it to another pot ... then back to the same one and thus changing it back and forth for a couple of times I finally cover it and let it rest for a couple of hours or more. 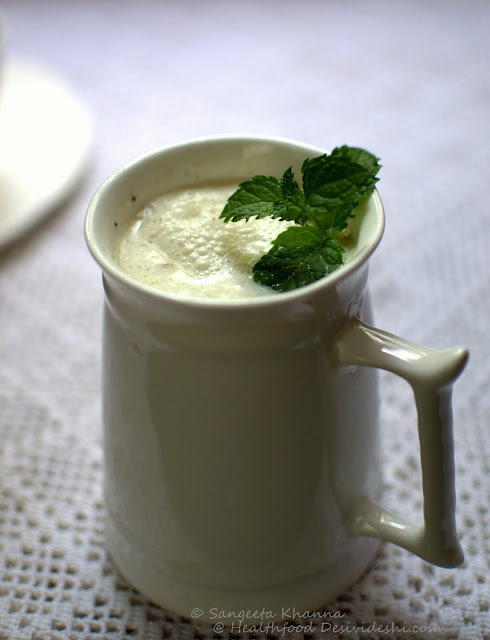 In summers I put the yoghurt in the freezer, then add a little Rooh Afzah and blend it to make some really refreshingly chilled, frothy Lassi which can then be packed in small thermus for carrying alongwith. Also love adding chopped apples and grapes to yoghurt during the season for a substitute lunch when trying to cut out calories. 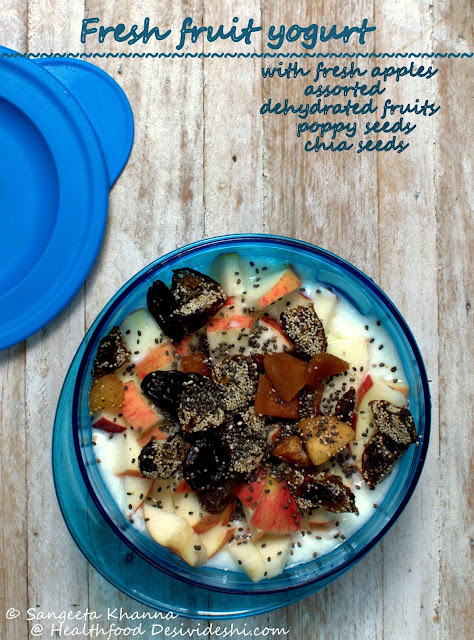 Hung yoghurt with mixed chopped fruits can be a wonderful party side dish. In Kumaon we take out the fibres of the huge special lemons (can be substituted with oranges here) they grow in the hills, add radish juliennes, pomegranate seeds, yoghurt, bhaange ka namak (salt with crushed poppy seeds) and honey. This is called 'Neembu mooli saananaa'. It's health benefits are amazing. My mother would often make various kinds of Shrikhand with hung yoghurt. Oh ! The possibilities with yoghurt are unending. P.S : Thanks again for this wonderful piece. Am sharing your link with my family and friends. Yoghurt is a must in my home specially where my son is concerned. Currently in a hostel doing his Computer Engineering this is one thing he misses the most there. However, I use very little Jaman to set mine at home; a teaspoon at the most. I then add lukewarm sieved milk (In winters I keep it slightly warmer with a little more Jaman) and having added the milk, I transfer it to another pot ... then back to the same one and thus changing it back and forth for a couple of times I finally cover it and allow it to rest for a couple of hours or more. In summers I put the yoghurt in the freezer, then add a little Rooh Afzah and blend it to make really chilled, frothy Lassi which can then be packed in small thermus for carrying alongwith. Also love adding chopped apples and grapes during the season for a substitute lunch when trying to cut calories. Hung yoghurt with mixed chopped fruits can be a wonderful party side dish. In Kumaon we take out the fibres of the huge special lemons they grow in the hills (can be substituted with oranges here) add radish julliennes, promogranate seeds, yoghurt, bhaange ka namak (salt with crushed poppy seeds) and honey. This is called 'Neembu mooli saananaa'. It's health benefits are amazing. Thank you so much for the generous word Archna. That sana hua nimbu recipe is there on the banaras blog :-) I love that. Wow... Sangeeta, what a storehouse of information... 👌. Loved the way of carrying the yogurt culture, abroad. Thanks Sumanjit. Glad you liked. Thanks Donna. Chilies are wonderful in so many ways. You are one amazing food specialist! Loved this. Best wishes. I've tried so many other cultures here but unsuccessful so far. Could you try the red chili method Keerty? Thank you so much for commenting.